During my adult life I can remember going to various weddings and seeing the table decorations and thinking that when I get married I am going to do that all myself. As a self-confessed craft addict I had dreams of a trip to a flower market the day before the wedding and a nice and easy day of making beautiful flower arrangements for the tables. This was all ‘pie in the sky’ thinking before I really understood what work it takes to get a wedding together. When my closest friends got married about 4 years ago, they often told me how stressed they were with just having to decide what flowers they wanted, what napkin colour to choose and if it rains what would they do with the Chuppah?! I just kept thinking that if I ever got the chance to have a wedding I wouldn’t need to worry about all that stuff as I would have it all planned in my head and know exactly what I would want and then go and do it all myself in my own hand made style… How wrong was I?! 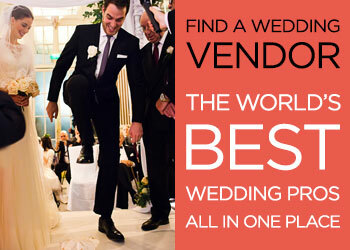 There are many reasons people want to craft their own wedding. 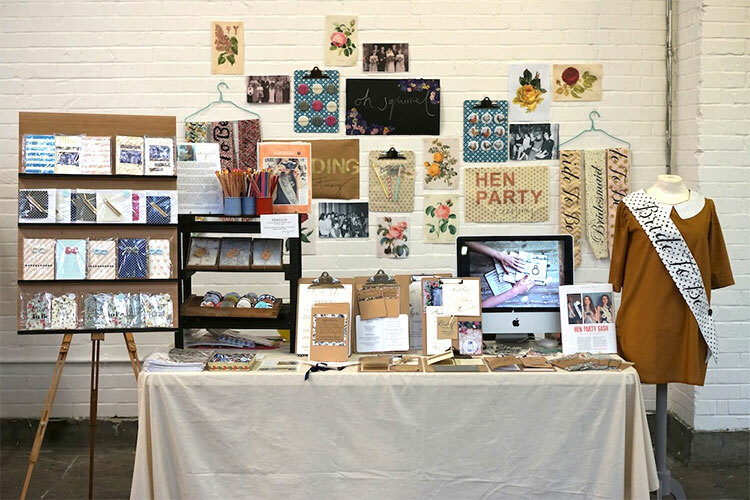 I’d say for me, hand-making things for our big day would mean that the day is that bit more personal and special, but for many it is also a money saving method. If you are like me and you like to do your crafting properly or not at all, then it is definitely not a money saving method! You can often spend more on the materials that you use than you would if you were paying someone to do it for you. I have also seen some stressed out brides who have a very tight grip on all elements of their wedding, delegate very little and then end up feeling exhausted and overwhelmed on their big day. I don’t want to be like that. I have never been very good at delegating; I much prefer to have control of everything. But increasingly since we got engaged I have realised that this is just not possible, especially with the demands of every day life. During the early stages of planning I grudgingly had to accept that there are some things I can do and some things I can’t, but we can still have our own personal touch on the day. So long as I choose the right suppliers! The first thing I had to decide was what could I do myself. I looked down the list of things to do and picked out things I’d either really like to do or thought I could do successfully ahead of time and not be left doing the day before the wedding. So I came up with a handmade list. Favours. Signage. Table names. Place cards. Table plan. Chuppah. The one thing that I really wanted to do was our invitations. My grandfather was a sign writer and brilliant calligrapher and recently I have been trying to learn a little bit about modern calligraphy in the hope that I could be half as good as he was. I also thought that this would be a lovely way of incorporating my grandfather into the wedding when he (along with my maternal grandfather) would be sorely missed from the day. I had taken part in a couple of workshops for modern calligraphy and brush lettering at Quill London and really hoped that I could get my skills up to scratch in time. To be fair to myself, they aren’t that bad, but I was not confident enough to do such a big task and I knew that I would never truly be happy with it if I did them myself. Sara is a true Smashing The Glass bride — she did it her way (to paraphrase old blue eyes). For Sara, this meant a traditional Jewish ceremony with some of her and Ben’s own egalitarian touches added in. 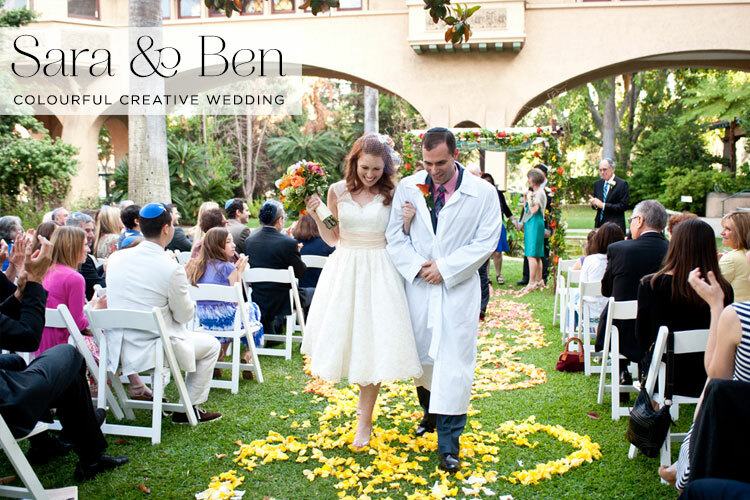 It meant a beautiful home-made chuppah, created by her mother, that integrated small pieces of her and Ben’s past, and it meant listening to her instincts when she felt weird, alternate pressure to create something quirky and cool, and needed a middle ground. Ben was great at helping her to acknowledge when she needed to relax and let it go, and he did much of the work, making a lot of small details happen. The end result is a wedding full of personality, astonishing detail straight from the heart, intimacy and gloriously magnificent colour. What could be be more perfect? The gorgeous couple first met in Israel whilst Sara was living there and Ben was visiting on holiday. She was taking classes in Jerusalem, and while Ben was in town he wanted to sit in on a class, since he had attended the same school a few years earlier. One morning in January, Sara walked into her usual class and Ben just happened to be sitting next to her regular seat. They struck up a conversation and ended up being chevruta (study partners), but spent most of their study time chatting and getting to know each other. By the end of that day’s class, they had exchanged emails and after Ben returned to the US they started getting to know each other first on email and Gchat, and then long hours over the phone. Several months later, when Sara arrived back in NYC, Ben was waiting for her at the airport with a bouquet of flowers. That was three and a half years ago…. I’ll now hand over to the lovely Sara to tell the story of her and Ben’s wedding day from June earlier this year. Sara, the Bride: We were married in Pasadena, California, which is a city in Los Angeles county. I’m from the Pasadena area, and although I moved to New York City seven years ago, I still feel very connected to Southern California. My family and many of my dear friends still live there. Ben is from the Bronx, and likewise, feels very connected to his city, NYC. Since we both live in NYC, and our lives are anchored there now, I really wanted a wedding that would change the centre of gravity a little. California is such a huge part of who I am, and therefore it felt like an authentic place to officially declare our love. In addition, I wanted my family to feel connected and involved. The fact that I live in NYC often means they can’t be involved in the details of my life, and I wanted to change that. “It’s like rai-ayy-ann on your wedding day…” Alanis Morissette famously sang. And it’s not ironic, it actually doesn’t matter one jot! 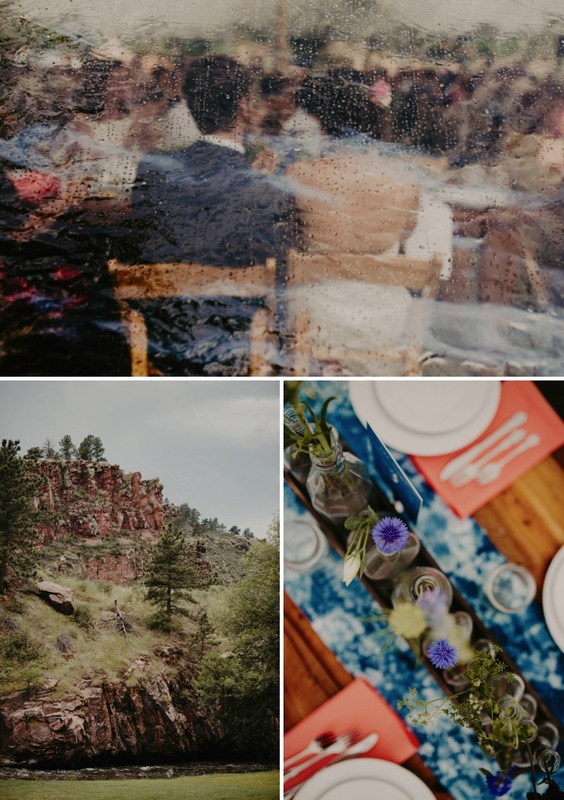 This wedding proves that, for one, you’ll end up with some incredible pictures (today’s images are by the awesome June Cochran). 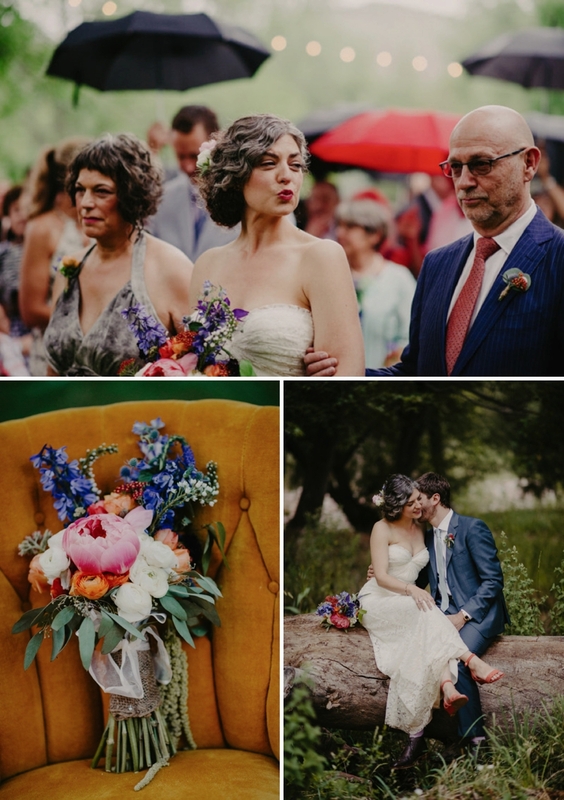 I’m talking happy guests dancing in the rain, colourful umbrellas adorning the ceremony, and a whole heap of merriness and creativity totally untroubled (hell, even enhanced!) by the showers. 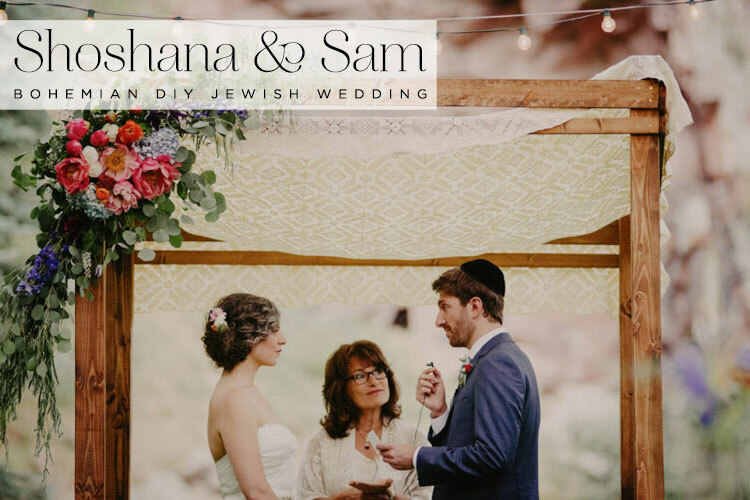 Shoshana and Sam mixed Jewish tradition and boho chic together effortlessly, and handcrafted so many thoughtful details for their W Day. They are also testament to the fact that wedspiration can strike anywhere: their colour scheme was inspired by coffee packaging they came across at their local grocery store! And doesn’t Shoshana look beautiful? Her French lace Sarah Seven dress is divine and I love how she’s accessorised her look with fresh flowers in her hair — she looks sensational. 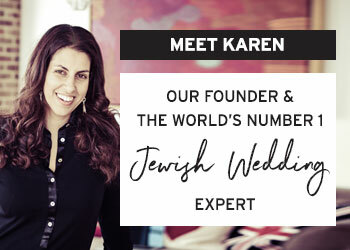 This detail is so very special and an illustration of exactly why I started Smashing The Glass — to inspire you with the most beautiful, creative and symbolic ways to personalise your Jewish (or Jew-ish) wedding from start to finish. Shoshana and Sam’s W Day has it in bucketfuls. Take it away you two! Shoshana, the Bride: Sam and I met in graduate school at NYU while studying Food Systems. We actually had a mutual friend in common (that lived in Colorado) that told me to look for Sam in one of my classes. I spotted him, eventually introduced myself, became friends for about 6 months and then started dating. Much more to the story than that but that’s the simple story! Nikki and Gavriel met via the power of Google search (no kidding… read their ‘how we met’ story below!) 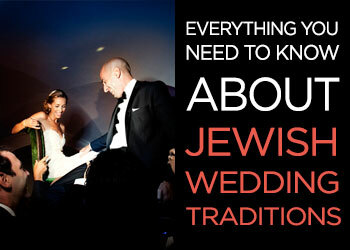 but their Jewish wedding was far from hi-tech. 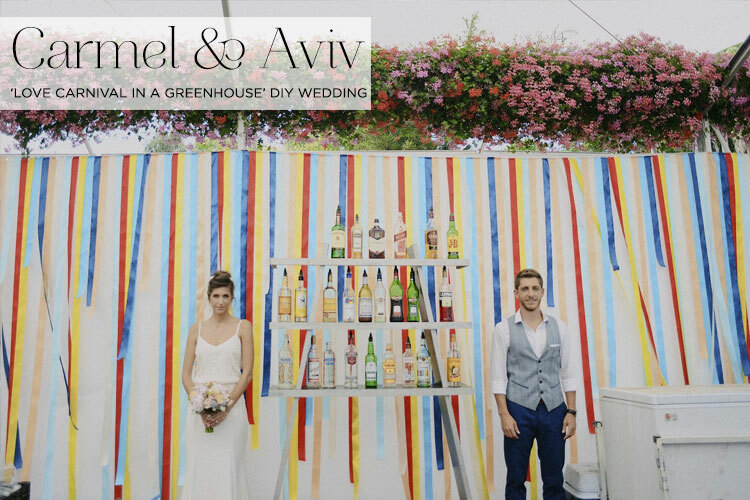 It was a super cool, relaxed rustic affair set in Gavriel’s home town in Israel with an abundance of lovingly crafted DIY details. So much of the wedding was DIY’ed straight from the heart, from the stunning florals organised by the couple and their families (no pro florists involved at all!) to the home-made wooden signs, hay bale seating, BBQ menu and the beautiful bride’s jewellery all made by Gavriel’s mother. 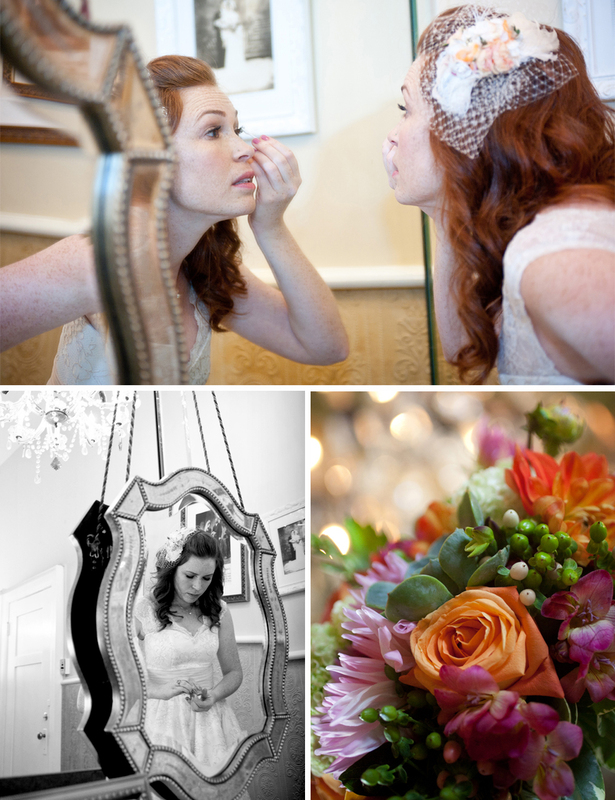 She also created Nikki’s stunning baby’s breath flower crown. Is she one talented mama or what? 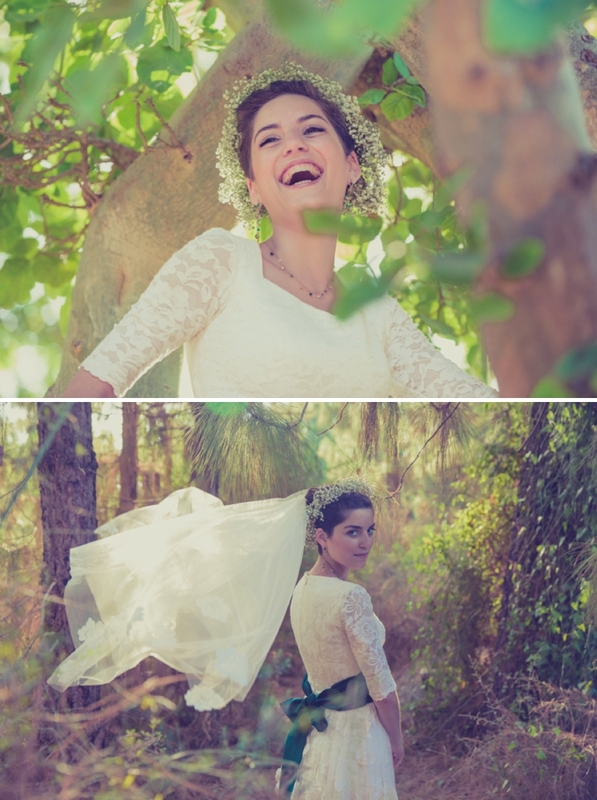 I absolutely love Nikki’s bridal style and how she accessorised her dress with that deep green sash. And she totally rocks those cowboy boots of hers. 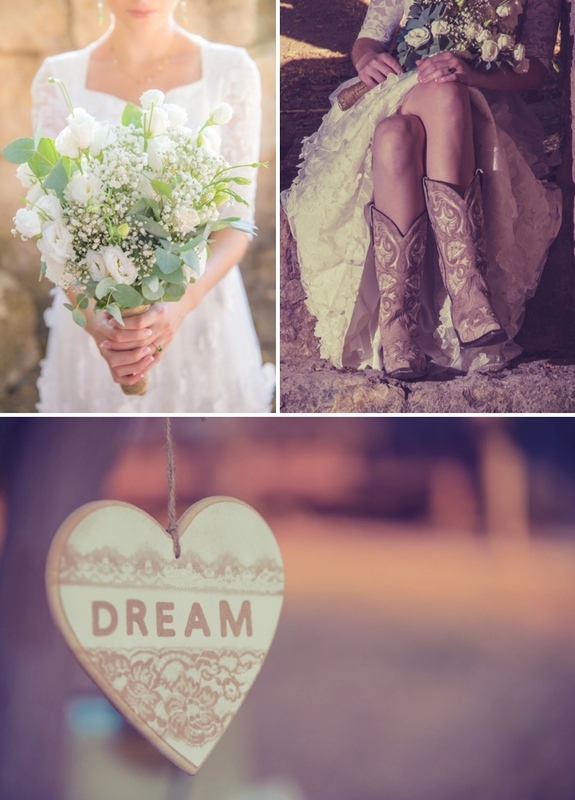 I’ve always loved a bride in cowboy boots — such a cool look for a country style affair. The whole W Day is full of natural and rustic details — unfussy and relaxed, but ever so pretty. 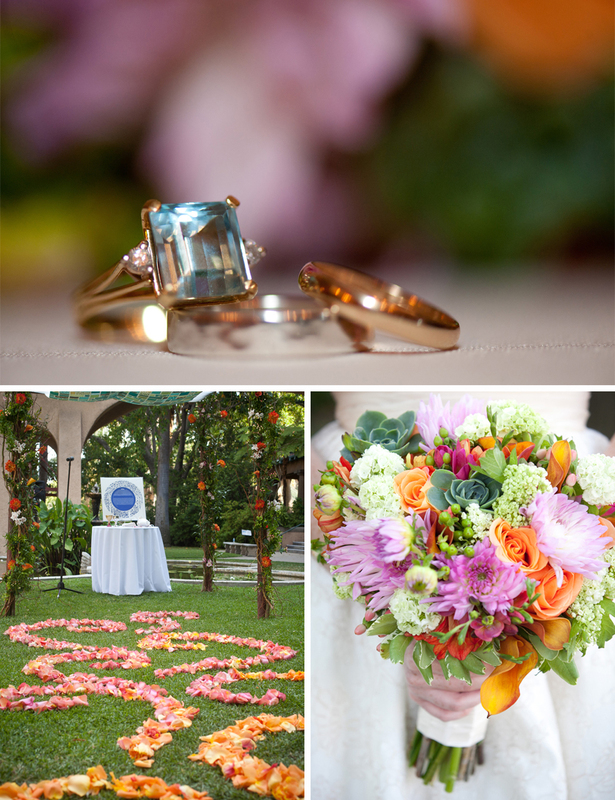 Perfect for a venue surrounded by wonderful nature. 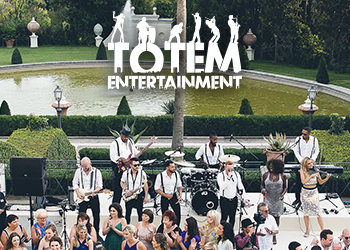 Enjoy this treat of a Friday wedding with images by one of our ever-talented Smashing Suppliers, Herschel Gutman Photography, who captures the essence of the day perfectly. 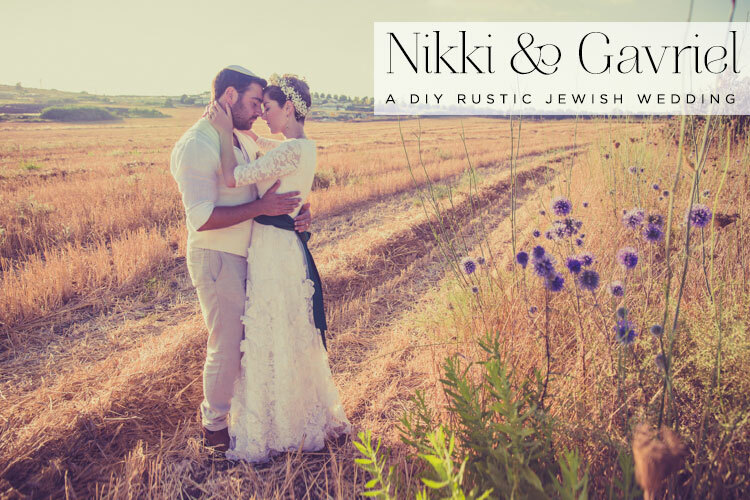 Nikki, the Bride: A friend and I were looking for a new experience and for whatever reason googled “religious farms in Israel”. We found a little family farm on a moshav and helped out a here and there with the farm duties on our stay. The daughter of the family asked if we wanted to hang out with her and her friends. We said yes and through her we met a group of guys. The mother of the family told us, “be careful — moshav boys are dangerous!” But over the course of the weekend I hung out with Gavriel on the moshav.. we talked and I listened to him playing the guitar and singing (as well as admiring his devastatingly good looks!) I couldn’t not give him my number…. Well the rest is history and here we are about two years later…. as husband and wife! Carmel and Aviv knew that they wanted to make their wedding as personal to the two of them as they possibly could, so what could be better then doing everything (and I mean everything!) themselves? Oh yes — once these two had decided on a DIY W-day, it was full steam ahead, and then some. Get ready to admire what is probably one of the most DIY’d weddings I have ever featured on Smashing The Glass. It truly gives new meaning to the phrase, ‘labour of love’. For 6 months, this gorgeous pair made the drive every weekend from Tel Aviv, to the groom’s family farm in Northern Israel to renovate an old greenhouse from the bone. They straightened the ground, laid a concrete dance floor, and planted literally thousands of flowers and trees. (To give you an idea, they planted about 400 sunflowers in one field alone!). And it didn’t stop there. Once the space was ready, Carmel and Aviv made everything themselves from the decorations to the flags to the signage, not to mention hand-crafting their invitations, table numbers and place names. There was also a flower booth on the day, with live flower weaving to decorate the guests. Genius. 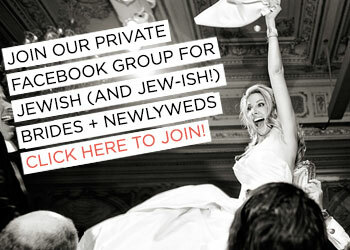 The most personal thing they incorporated though, was a wonderful heirloom — their chuppah canopy. It has been used in the groom’s family for two generations for every wedding in the family, and Aviv’s grandmother weaves the names of every new couple into it. How magical is that? Their day is exquisitely photographed by the super talented Shai Franco and don’t miss the highlights film at the end by the equally accomplished Shahar Lev.